I’m a big fan of GonzoBanker. When I first started working at Vancity, I was brand new to financial services and started looking at industry websites to help orient and ground me in my new job. I quickly came across GonzoBanker, and it is now one of the only leftovers from those early days of bookmarking. Their irreverent coverage of how IT issues can aid and hinder financial institutions is both useful and entertaining. So today, I was thrilled to see that they named my friend Gene Blishen as their GonzoBanker of the Month. Gene is my hero. He is a philosopher, humanitarian, technologist, futurist, banker and a decent, decent man. I look forward to reading his blog whenever he updates it, and his name always comes up when the people I respect the most name the people they respect the most. It is an honour to be his direct BC credit union peer, be able to access his sage advice and plan BarCampBankBC with him. So congrats Gene. Well deserved! Make a plan for BarCampBankBC. Yesterday, Gene Blishen and I booked the space for BarCampBankBC. I’m very excited that we got such a great space at BCIT (British Columbia Institute of Technology). 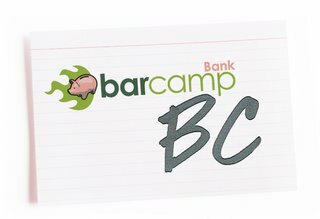 BarCampBankBC will take place in Vancouver all day on Saturday, September 20th and a half day on Sunday the 21st. You can sign up here. What if we changed banking and finance? The aim of BarCampBank is to foster innovations and the creation of new business models in the world of banking and finance. We’ve already got 16 people coming from some great FIs and vendors, including HSBC, Industrial Credit Union, Westminster Savings Credit Union, Everything CU, Credit Union Central of BC, Creative Brand Communications, Citizens Bank of Canada, Ripple Project, Open Money, Mount Lehman Credit Union, Community Savings Credit Union, Vancity and Currency Marketing. And I just noticed Denise Wymore is planning on coming in for it. I have no doubt that by the time September 20th and 21st arrive many more FIs and vendors will have signed up. BCIT’s downtown campus is extremely well located, right in downtown Vancouver. If you’re coming in from out of town, you can walk there from any of Vancouver’s downtown hotels. It’s also very close to a SkyTrain station, so it’s easy to get to from almost anywhere. All that for about $35 Canadian. So go ahead, add your name to the wiki and come on down. UPDATE (May 29): Thanks to Boris for adding this event to Upcoming.org!